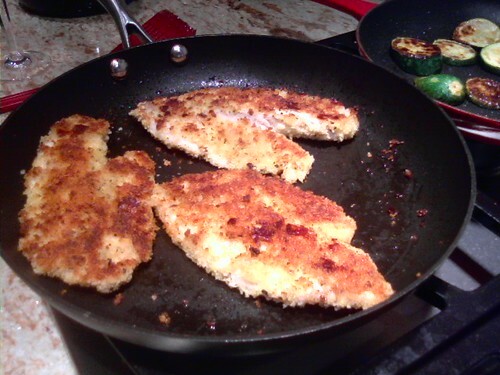 Since I did a sinfully delicious post on our Mardi Gras dinner, I figured I should also post our meat-free Ash Wednesday dinner as well: Pan-Fried Tilapia! It’s definitely a stand-by dinner in my family for a quick, delicious, and healthy meal. Here’s how I like to prepare it. Measure your olive oil into a large frying pan and warm it up over medium heat. Meanwhile, measure flour into a shallow dish. Season generously with salt and pepper. Crack eggs and measure buttermilk into a second shallow dish, mixing lightly with a fork. 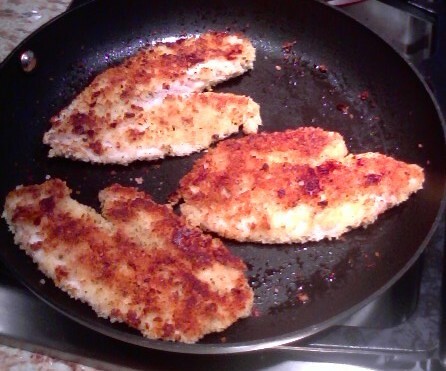 Measure panko bread crumbs into a third shallow dish, seasoning generously with salt, pepper, and whatever other seasonings you like (garlic, herbes de provence, greek seasoning, cajun seasoning, lemon pepper – the possibilities are endless!). Take one tilapia fillet. Coat it first in the flour mixture. Next, dip it in the egg mixture, coating on both sides. Finally, dip it into the seasoned panko bread crumbs to coat completely. Drop the tilapia in your preheated pan. Repeat with remaining tilapia fillets. Cook for about 4 minutes per side (depending on the thickness of your fillets). You will know that your fish is done when it flakes when tested with a fork. Serve immediately with potatoes, grits, your favorite veggies, or a nice green salad. I apologize for the lame-o cell phone pics, but as some of you know my life is a bit crazy and I don’t always have my wonderful new camera with me, depending on where I happen to find myself at dinnertime!